Last week I noted EDPuzzle a free tool to make existing videos more valuable and interactive. Penn State's Beth King, Senior Lecturer / Assistant Program Manager for Online Geospatial Education, shared that the school's Teaching and Learning with Technology team explored several tools like EDPuzzle last year and prepared a report. The Dutton E-Education Institute has selected HapYak (which isn't in the report above) while other groups will make their own choices. One issue that came up: the accessibility of the resulting videos for disabled students. The GIS and Analysis Tools pilot exam will no longer be offered due to USGIF receiving the total number of pilot exam participants. But the Remote Sensing & Imagery Analysis and Data Management exams are available. Testing will be held 8-11 a.m. and 1-4 p.m. at USGIF headquarters in Herndon, Va. USGIF on Nov 7 and Dec 5. I’m not teaching you how to use Google maps; I’m teaching you how to make it. Amy Lobben, the head of the geography department at the University of Oregon describing a new SDST (undefined, sadly) degree expected in 2016. Geography Awareness Week starts November 15th and so does OSM Geo Week. HOTOSM staff suggest it's a great opportunity for schools to come together and map to prepare communities for the next disaster as part of the Missing Maps project. In related news, earlier this week University of Utah and Brigham Young University volunteers worked with HOTOSM on mapping related this week's earthquake in South Asia and last week's Hurricane Patricia. There are many logos at the bottom of the HOTOSM GeoWeek page. There are none at NatGeo's GeoWeek page. As for GIS Day, it has two supporters listed: Esri and OGC. 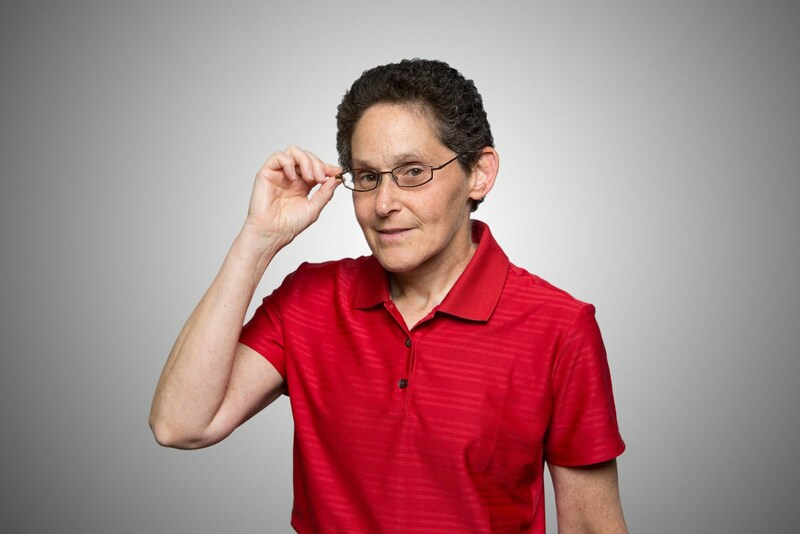 In the past, one of our GIS instructors spent half the semester assisting her distance learning students in loading and configuring software on home systems. Now, students can access a software image remotely that exactly matches the lab experience, and the instructor spends more time teaching and working with students on course materials. I understand the motivation. Still, installing software is an important skill to have! This is an Esri focused program best I can tell (GIS course list). A team of University students and alumni launched a new social app for students this past Thursday. The app, called Hoos Out, features a social map designed to give students an accurate portrayal of the most popular places on and off Grounds. I'm not sure what a social map is, but the app has that and a heat map per an article in the school paper. USGS Crowdsourcing Efforts: Field Work for Students? Having students work on real world projects is always a goal. Since the USGS seems to have a "TNMCorps student contractor" I guess students get involved in its work, too. For those who've not seen the program, here are the basics from the latest press release. 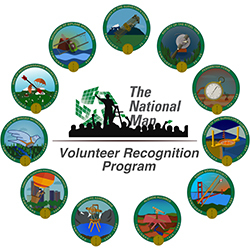 Volunteers are being recognized and earning custom badges for making significant contributions to the U.S. Geological Survey's ability to provide accurate and timely information to the public. Using crowdsourcing techniques, the USGS project known as The National Map Corps (TNMCorps) encourages volunteer “citizen scientists” to collect manmade structure data such as police stations, schools, hospitals and cemeteries, in an effort to provide more precise and authoritative spatial data for the USGS web-based mapping portal known as The National Map and updated US Topo map products. University of Toledo geography professor Kevin Czajkowski will take the lead on a $10 million initiative to develop a project-based curriculum in STEM — science, technology, engineering, and mathematics. The goal is to make learning in those subjects more hands-on for students, immersing them in projects to solve problems through science, with the aid of NASA data. There's no explicit mention of geography or geospatial technology in the story on the grant, but I'm thinking "it's in there." 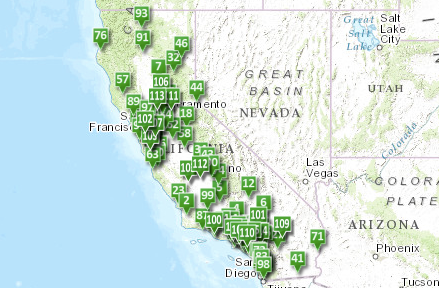 The map of four year public and private universities, and two year public colleges in the state was created by California Geographic Alliance. I have lots of questions (as I do for many story maps): What is its purpose? How would a potential college student use it? Is this the right format for this type of map? Date and source of data? Via: Michael Gould (@0mgould). The slides from Carl Sack's talk at NACIS do not exactly explain how the the developer focused mapping course is designed. They do indicate how carefully UW-Madison educators follow student progress in a course. is offering free tuition through a state program to qualified Wyoming residents, and scholarships to nonresidents, if they earn a credential, a certificate, or an associate of applied science (AAS) degree in GIST from CWC. In exchange, the students must work in-state, usually in temporary, full-time paid positions during the summer or in part-time jobs during the school year, to help meet Wyoming's need for GIST-trained technicians. I could find no list of courses on the program page, but since the "offer" is only made via ArcWatch, my guess is this is an Esri-centric program. Details in ArcWatch, Via: GISUser. the first California school to address the State Educational Technology Directors Association (SETDA). Students made their presentation during the Education Forum at the association’s annual Leadership Summit. The presented work involved GIS. Actually, it involved "mapping technology software." MSTMA was invited to share their [sic] work integrating technology with their Service-Learning Project to explore community rights. For their project, students used mapping technology software to create data-driven research that examines how gentrification, affordable housing and characterization of public schools was shaping their community. Students not only researched, but also designed workshops to educate their peers, teachers and the school community. What "mapping technology software?" If you read the story on the Partnership for Los Angeles Schools, a non-profit which runs Roosevelt and other schools, you'd not know. If you read it on GIS User you'd get a link to Esri's ConnectED page.